1. I still don’t believe this really happened but the folks at Food & Wine ran an interview with me on Tuesday, and I came close to fainting when I saw my mug front-and-center on their homepage. I am shocked and honored. 2. Speaking of my mug, my very good friend Sam (with whom I’ve eaten A LOT of food) took that photo of me because I’m camera-shy and had nothing appropriate to submit. In addition to dogs, plants, and food, she can now add Sachas to her list of captures. Soon there will be a lot more first names on that list. 3. I can’t wait to get my hands on Kimberley Hasselbrink’s cookbook Vibrant Food. Everything I’ve seen from it looks right up my alley—and just in time for farmers’ market season. 4. I saw Phosphorescent live in May. Do you know them? You should, because the set was so, so beautiful. Especially this song with extended intro live. The exact measurements (it can be hard when rolling the rectangles) in step 2 are not that important, as long as the rectangles’ thickness is 1/8 inch to 3/16 inches, the length of the rectangle is longer than the width, and the second rectangle is proportionately a bit larger than the first one. I’ve made a similar filling successfully with alternative sweeteners (honey, maple syrup, or coconut sugar, but no fake stuff), if you’re so inclined to try. The tarts are just as delicious without the glaze if you don’t want to add it. The glaze will take 15 to 30 minutes to set, but you don’t have to wait that long to eat the tarts if you don’t mind the glaze being wet! Because if you don’t wait, the centers will still be warm when you eat them. 1. For the tarts: Combine rhubarb, sugar, and cornstarch in large saucepan. Cook, covered and stirring occasionally, over medium-low heat until rhubarb is very soft, 10 to 15 minutes. Increase heat to medium-high and cook, uncovered and stirring frequently, until mixture has reduced, thickened, and become jammy, about 10 minutes longer. Stir in lemon zest and diced rhubarb, transfer mixture to bowl, and let cool completely (rhubarb mixture can be refrigerated for up to two days before using). 2. Adjust oven rack to middle position and heat oven to 400 degrees. Line baking sheet with parchment paper. Lightly beat 1 egg in small bowl and set aside. Using bench scraper, cut dough rectangle in half crosswise. Return one half of dough to refrigerator. Roll one half into about 12 by 10½-inch rectangle that is 1⁄8 to 3⁄16 inch thick, with long side facing you. Trim sides if they’re uneven, cutting off as little dough as possible. 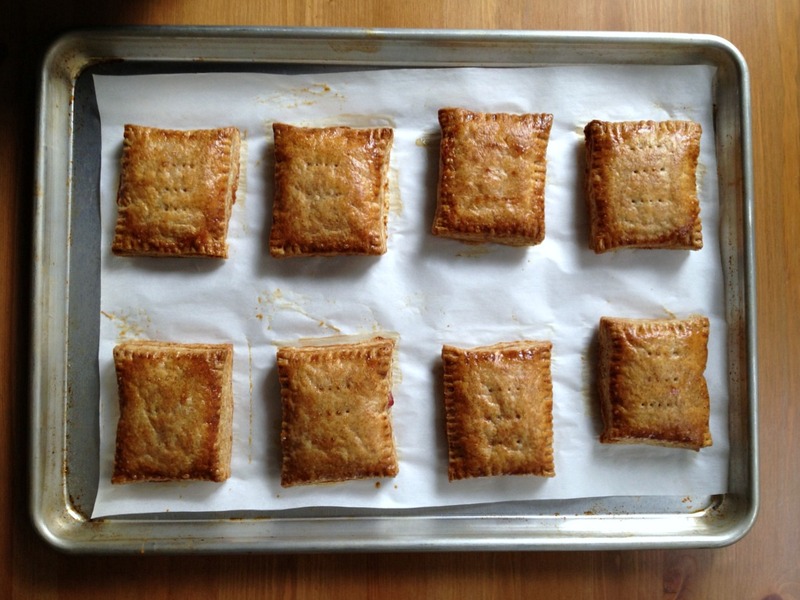 Cut dough into 9 equal-size rectangles. 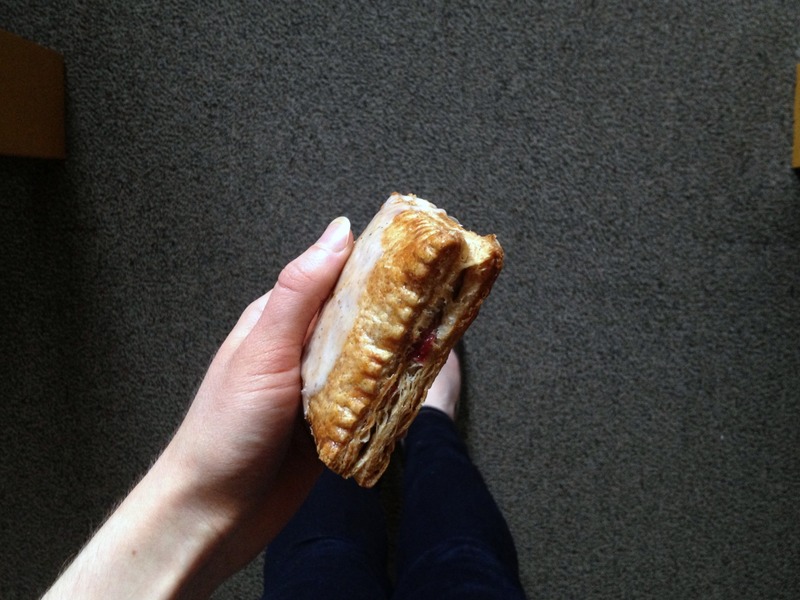 Refrigerate rectangles and repeat with remaining dough square, rolling it to about 12½ by 11-inch rectangle. Place about 1 tablespoon plus 1 teaspoon rhubarb filling in center of 9 smaller dough rectangles and spread, leaving about ½-inch border around edges. Brush exposed edges of topped rectangles beaten egg. Top with larger dough rectangles, pressing edges with tines of fork to seal. 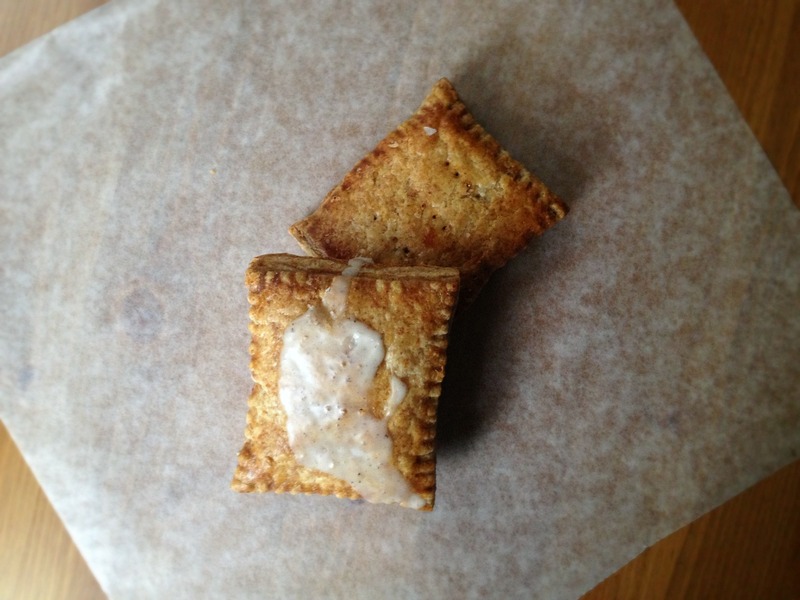 Using fork, poke the tops a few times and freeze tarts for at least 30 minutes or up to 1 month before baking. 3. Lightly beat remaining egg in small bowl. Transfer frozen tarts to prepared baking sheet, brush with beaten egg, and bake until the tarts have completely puffed, about 10 minutes. Reduce oven temperature to 375 degrees and bake tarts for 20 to 30 minutes longer, rotating sheet hallway through baking until crust is well-browned and crisp. 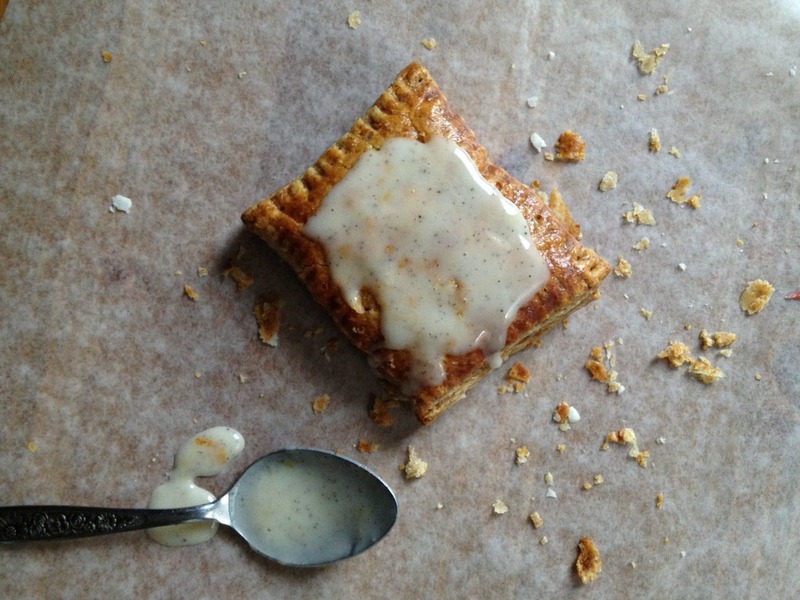 Let tarts cool for at least 30 minutes before glazing. These look beautifully flaky and rhubarb and cardamom? One of my favourite combos. Heading over to read your F&W interview now! Wow. Thanks so much, Kate! I appreciate your support. OMG I could demolish a few of these! Cardamom is one of my favourite spices in desserts :-) Congrats on the F & W interview! Thank you! Sometimes I wonder if I turn to cardamom too much, but I’m happy to know that others are just as enthusiastic about it. Thank you, Megan! And I’m so glad you liked the tarts. Your opinion obviously means a lot to me! Oh my goodness. That’s all I can say. Hi! I don’t really use vodka in my pie dough anymore, but you’re right: I did include it in my 2012 cherry pie recipe. Replacing a bit of the water with vodka is good for limiting gluten development, especially for those who are afraid of pie dough making. However, I now usually use the fraisage method for all quick all-purpose flour pie doughs (see this post: https://729layers.com/2012/12/19/healing/) and no longer feel the vodka is necessary for me. Feel free to use your discretion. Now, the rye crust follows a quick puff pastry method, essentially, but it does include some cider vinegar which works as a tenderizer. Hope that answers your question!